By Prepared by Kevin P. Banks, MD, Department of Radiology, Brooke Army Medical Center, Fort Sam Houston, TX, and Justin Q. Ly, MD, Department of Radiology and Nuclear Medicine, Wilford Hall Medical Center, San Antonio, TX. Conventional radiographic evaluation of the ankle showed a subtle fracture of the lateral process of the talus. An ankle CT, ordered to evaluate the extent of osseous injury, revealed extension of the fracture to involve a small portion of the inferolateral articular surface. The lateral process of the talus is a large, wedge-shaped osseous projection that extends laterally from the body of the talus. Its inferolateral surface comprises a portion of the posterior facet of the talocalcaneal joint, while its superolateral surface articulates with the lateral malleolus.1 Its functions include lateral stabilization of the ankle, weight bearing by means of its articulation with the ﬁbula, and subtalar motion. The lateral process of the talus is aided by the lateral talocalcaneal ligament that extends between it and the calcaneus.2 During ankle inversion, contact at the posterior talocalcaneal joint is maintained by the lateral process. 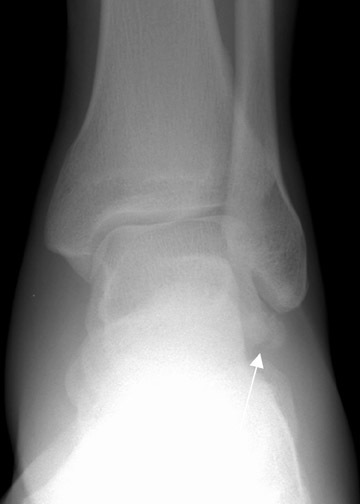 With concurrent dorsiﬂexion, increased forces transmitted via the ﬁbula can lead to fracture.1 This entity has been recognized as a cause of acute ankle pain in the younger population as the sport of snowboarding has increased in popularity.3 This activity routinely requires landing with the feet oriented in a vulnerable position, making this fracture a common hazard to snowboarders.2,4 Approximately 40% of lateral talar process fractures are improperly diagnosed at initial presentation.3 Individuals typically present with acute onset of pain over the anterolateral ankle, with varying degrees of swelling. Pinpoint tenderness is typically localized over the lateral process. Radiographic ﬁndings are subtle, with the lateral view providing the best visualization of the lateral process. When radiographs are negative and clinical suspicion remains high, ankle CT—optimally with coronal and sagittal reformations—is the deﬁnitive diagnostic study. Fractures of the lateral process of the talus are infrequent but may be a signiﬁcant source of acute ankle pain, particularly in the adolescent and young adult population whose growing participation in the sport of snowboarding puts them at particular risk for this inversion-dorsiﬂexion injury. Often misdiagnosed as a severe lateral ankle sprain, failure to recognize and treat this entity early can result in signiﬁcant morbidity in otherwise healthy young adults. Essential to the diagnosis are an elevated index of suspicion in the proper clinical presentation with a thorough radiographic evaluation, including CT ankle evaluation if radiographs are equivocal or only suggestive and clinical suspicion of a fracture remains. Leibner ED, Simanovsky N, Abu-Sneinah K, et al. Fractures of the lateral process of the talus in children. J Pediatr Orthop B. 2001;10:68-72. Cantrell MW, Tarquinio TA. Fracture of the lateral process of the talus. Orthopedics. 2000;23:55-58. Hawkins LG. Fracture of the lateral process of the talus. J Bone Joint Surg Am. 1965;47:1170-1175. Mills HJ, Horne G. Fractures of the lateral process of the talus. Aust N Z J Surg. 1987;57:643-646. Boon AJ, Smith J, Zobitz ME, Amrami KM. Snowboarder’s talus fracture: Mechanism of injury. Am J Sports Med. 2001;29:333-338. 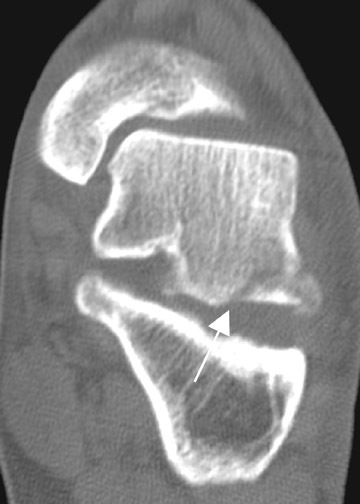 Fracture of the lateral process of the talus (snowboarder’s fracture). Appl Radiol.